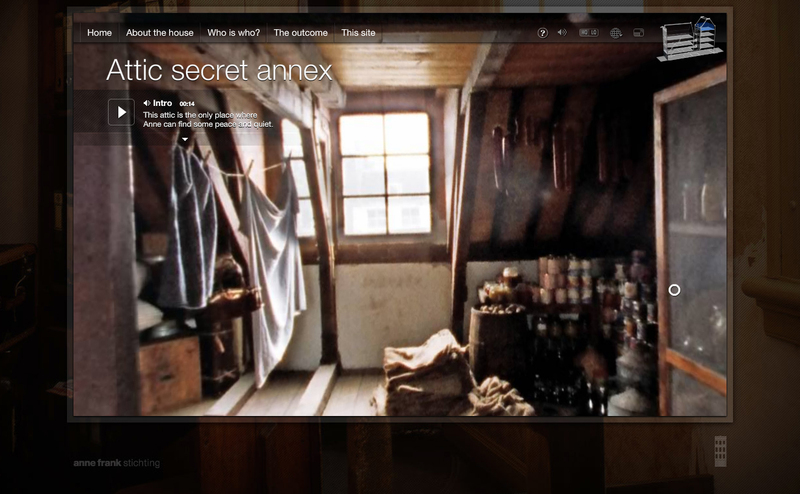 As part of the official 50th anniversary of the Anne Frank House, LBi Lost Boys and Anne Frank House have developed a 3D version of the house at Prinsengracht 263 in Amsterdam where Anne and her family lived in hiding for two years during the Second World War. 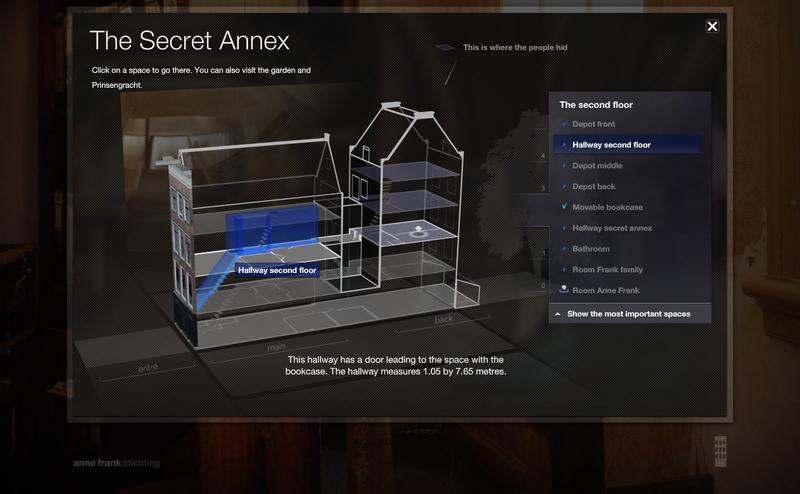 The Secret Annex Online is part of the new Anne Frank website, and allows visitors to explore the front of the house and the secret annex as it was then, and hear stories that explain in greater depth what happened there. The museum in Amsterdam is not furnished as the secret annex was cleared of its contents after those in hiding were arrested. After the war, it was Otto Frank’s wish that the rooms should remain empty. 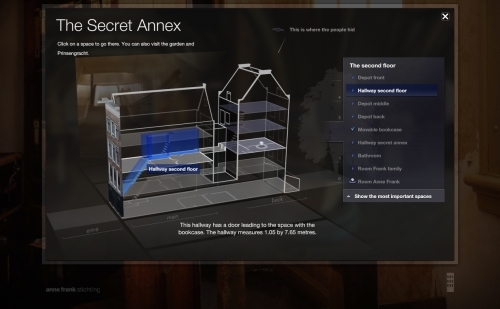 The online hiding place allows visitors to see and learn more about various objects not on view. The virtual rooms were furnished using reference photographs that were taken in 1999 when the front part of the house and the secret annex were temporarily re-furnished. The microsite is full of richly descriptive video clips, telling the story of Anne Frank through diary excerpts and archived witness reports. The English voice-overs are by Tamsin Greig and Ellie Kendrick, both of whom were involved in the 2009 BBC series “The Diary of Anne Frank”. Atmospheric music was kindly provided by Mark Isham, the American Grammy and Emmy Award-winning composer perhaps best known for his work on ‘Crash’ and ‘A River Runs Through It’. To spread the story of Anne Frank through social media channels, there is also a Facebook application. 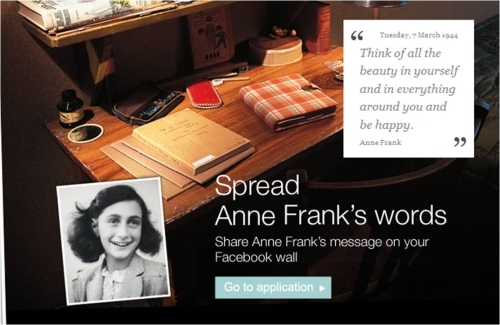 Selected quotes from Anne’s diary can be posted to your profile weekly or monthly, spreading her words of inspiration. The Secret Annex Online is Web Pick of the Week on Commarts, and was Site of the Day on FWA (Favourite Website Awards). More info can be found via the press release on RealWire.